How would you describe finding meaning in the work you do? Would you say that work is most meaningful when you are developing yourself? Would you say that that you find the most meaning when you are expressing your full potential? How about when you feel connected with others? Does doing service give you the most meaning? How about all of the above? If you answered “yes” to any or all of the four ways in which people find meaning in their work, then you are using the map of meaning. Whether you work to live or live to do your life’s work, what we do every day is not only a collection of activities, but a metaphor for our relationship with life. Authors Marjolein Lips-Wiersma and Lani Morris developed the map of meaning based on the findings in Lips-Wiersma doctoral dissertation. This dissertation focused on spirituality in the workplace. Her findings gathered from the input of a number of volunteers led her to conclude that spirituality at work correlates directly to the meaning we derive from our activities. Lips-Wiersma’s initial research yielded a model of meaningfulness in the workplace that started being applied by a number of individuals familiar with her work. Given this unexpected implementation of the model, Lips-Wiersma and Morris expanded the research to a much larger and broader set of participants, which led to the development of the map of meaning. This map has two dimensions: relating and presence. The dimension of relating extends from self to others while presence spans from being to doing. Their intersection forms four quadrants: 1) developing the inner self, 2) unity with others, 3) expressing full potential, and 4) service to others. In their research, the authors discovered that people who found the most meaning in their work were also experiencing fulfillment in each of the four quadrants in their lives. This means that “happy” people at work are individuals with fulfilling lives. This is where work and life meet in a holistic dance. The idea of separating work and personal life is an illusion. We cannot have a meaningful work life if we are not fulfilled in the totally of our existence. Lips-Wiersma and Morris also found that the dimensions of the map of meaning—relating and presence—are in a state of tension with their extremes. That is, the extreme of self is in tension with others as is being with doing. These tensions shift us from the ideal center, a position where the person is in a state of complete inspiration, according to the authors. When focus is more on self than others, unity and service to others is challenged. The opposite is also true. When we are dedicated to others disregarding self, developing inner self and expressing our full potential are less likely. The dimension of presence offers a similar tension. Focus only in being negates the possibility of expressing our full potential and servicing others. However, this focus is less likely than the one on doing. We tend to concentrate on doing at the expense of being. This translates into not developing ourselves and in not having deep and meaningful relationships. Inner self-development results from the meaningfulness that comes from active involvement with the person we are becoming as a result of being engaged in our life and work—from being a good person to being the best we can possibly be. There are three main sub-themes for this quadrant: 1) moral development, 2) growth, and 3) being true to self. Self-awareness is embedded in all three. Unity with others refers to the meaningfulness of living together with other human beings. This does not mean uniformity. It primarily involves finding unity in diversity. This comes from the understanding that humanity is essentially one and that experiencing this unity is what enriches our global humanity. This dimension also has three main sub-themes: 1) working together, 2) shared values, 3) belonging. Expressing full potential refers to the meaningfulness of making our mark in the universe. It is active and outwardly focused. This quadrant is based on the concept that we are all unique and that we are responsible for bringing our unique gifts and talents into the world. The three sub-themes for expressing full potential are: 1) creating, 2) achieving, and 3) influencing. Service to others is about the human need to make contributions to the wellbeing of others, from helping an individual to making a difference in the wider world. Its two sub-themes are: 1) making a difference and 2) meeting the needs of humanity and the planet. The map of meaning is a simple concept with powerful implications. 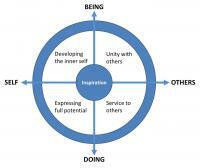 Each of the quadrants offers much reflection and opportunity to find meaning. However, its holistic and balanced perspective is the real key. Here are some examples. An extreme focus on inner self development can lead to passivity and navel gazing. Too little focus in this quadrant can result in being washed away by others and in neglecting our own identity. In the service to others quadrant, an extreme attention to it can result in martyrdom and exhaustion. The opposite focus would negate the ability to contribute and be part of a community. Extreme focus on the other two quadrants—unity with others and expressing full potential—has similar implications. Next time that you are out of sorts, reflect on which quadrants you are not expressing or are too focused on. Find activities that help you bring them into a state of fulfillment. Check yourself again and compare. You should also practice the opposite. When you feel totally inspired in your activities, reflect on the quadrants and see how you achieved this balanced state of fulfillment. Remember, the state of your life is mirrored in your work and your work is your life’s expression.